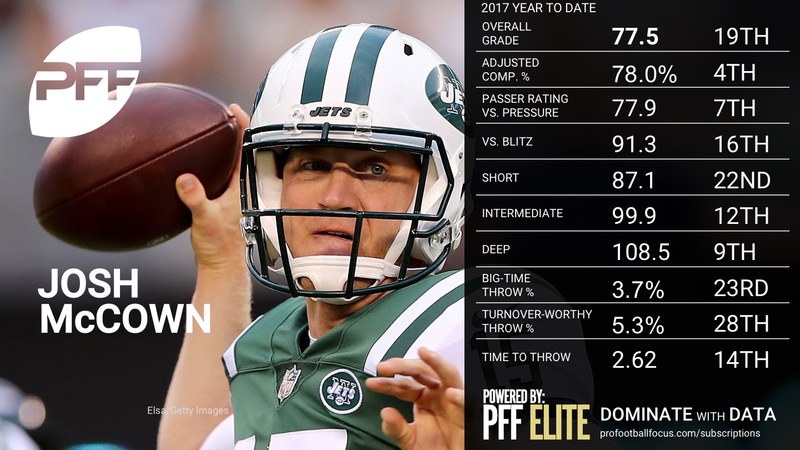 PFF Analysts Steve Palazzolo and Zac Robinson give you an overview of every team’s quarterback, and where they rank in terms of overall PFF grade as well as detailed notes on a select few who stood out for good, or bad, reasons in Week 11. 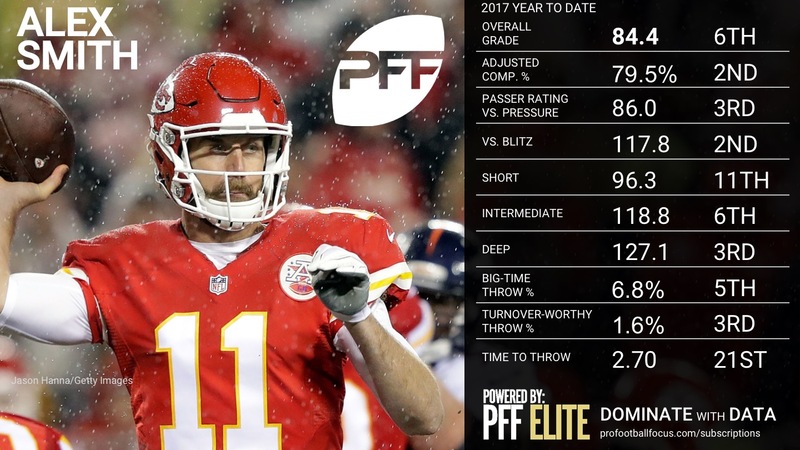 These rankings are based on their overall grades after Week 11, and can be found as a part of the PFF Edge subscription. Brady put on another clinic against the Oakland Raiders this week, taking the open man in the short game (16-for-17 for 136 yards on 0-9-yard passes) while also throwing efficiently down the field (8-for-11 for 194 yards and two touchdowns on passes thrown 10-plus yards in the air). 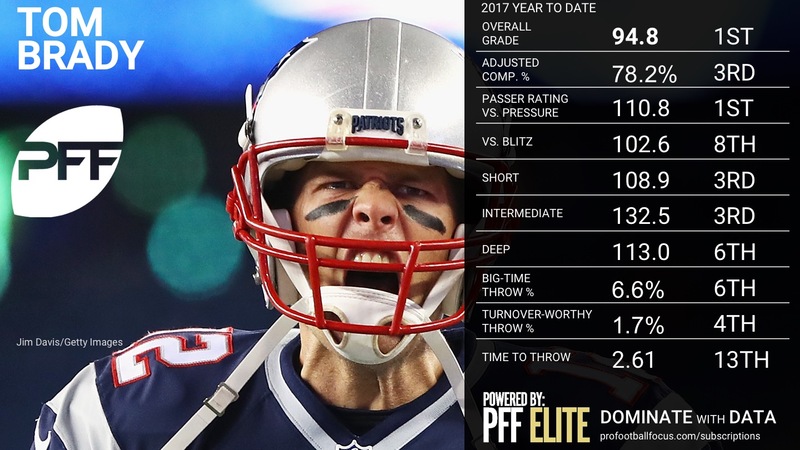 Brady’s work under pressure is the best in the league this season and he finished 6-for-7 for 61 yards and a touchdown when pressured against Oakland, good for a passser rating of 142.6 for the game. 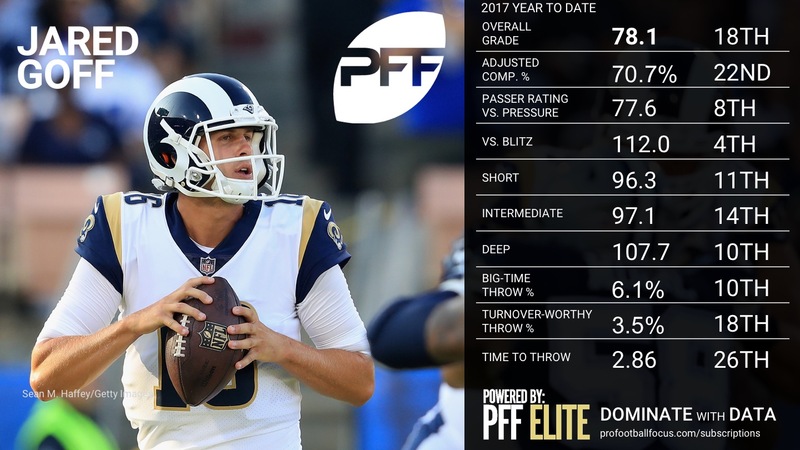 Ryan remains one of the hottest players in the league and he played a clean game from start to finish against the Seahawks. While he finished with only 195 yards, he was on point this his decision-making and ball location the entire night, and it started with a well-placed deep ball that would have gone for a 40-yard score if not for a defensive pass interference penalty (boxscores lie sometimes, you know?). 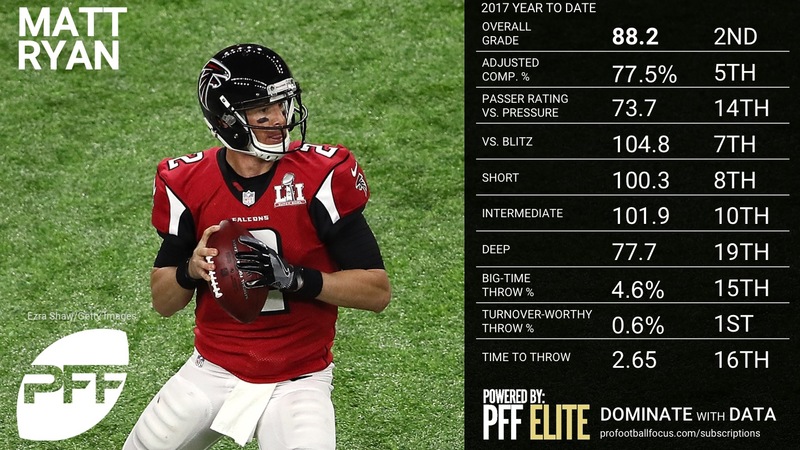 Ryan hit two other #BigTimeThrows on the night, first on a tight end throwback as he hit TE Levine Toilolo up the seam for a 25-yard score and his best throw of the night went to WR Julio Jones as he dropped the “go” route in a bucket on third-and-six with 7:39 to go in the game. 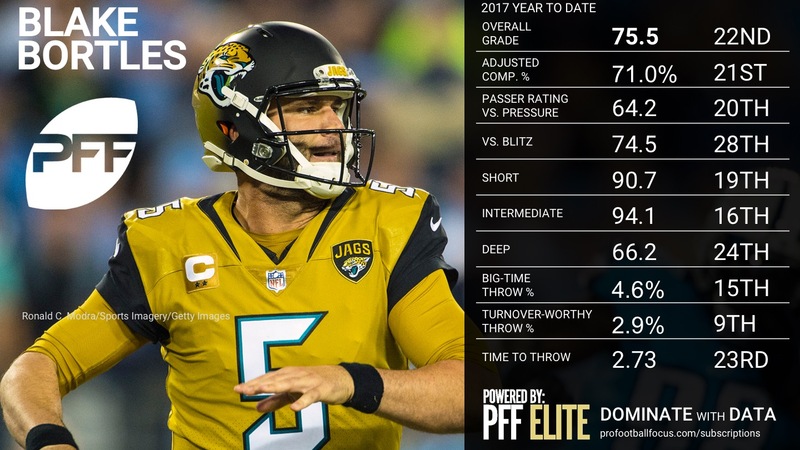 Ryan made plays when it counted as he was fantastic on third down and he finished 6-for-8 for 80 yards and a touchdown when pressured, good for a passer rating of 145.8. 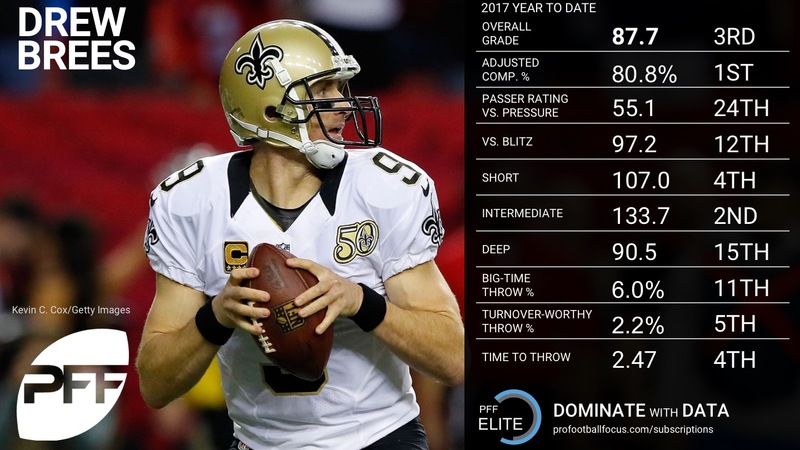 Brees has been playing more of a game manager role this season, but he showed he’s capable of leading the team through the air if need be. 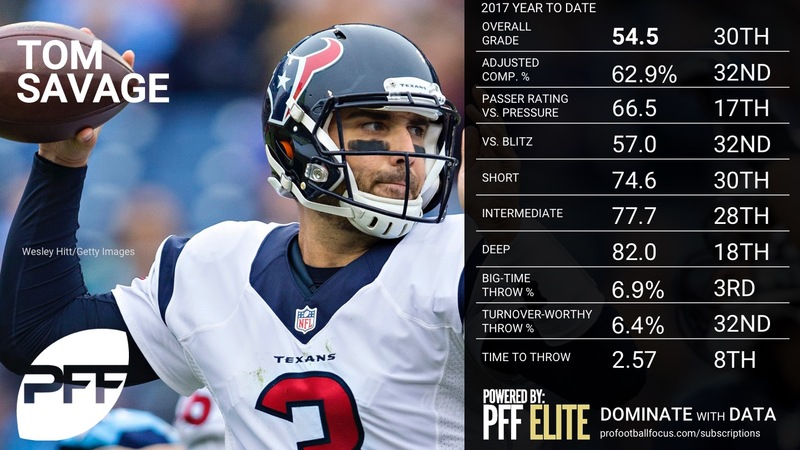 He kicked off his fourth quarter game-tying drive with a poor throw that should have been a game-ending interception, but an unnrelated penalty bailed him out. After that point, Brees smoothly led the Saints up the field to tie the game and eventually won it in overtime. 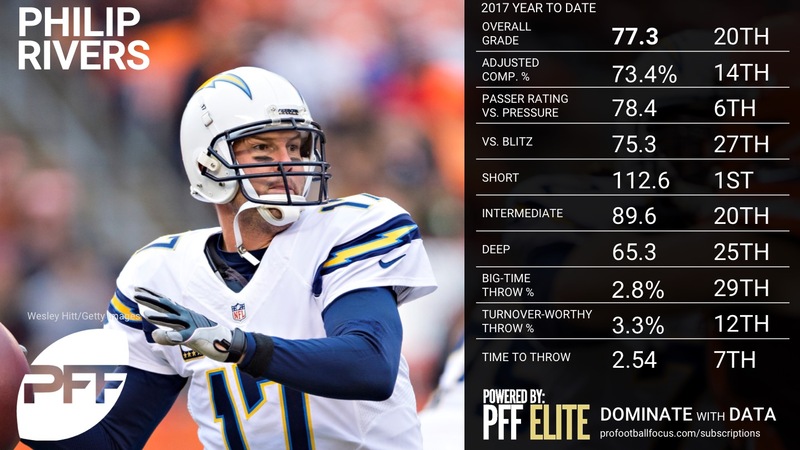 Aside from the negated interception and an early floated pass that was picked off, Brees spread the ball around efficiently, with his best work coming in between the numbers where he went 17-for-20 for 237 yards and a touchdown. 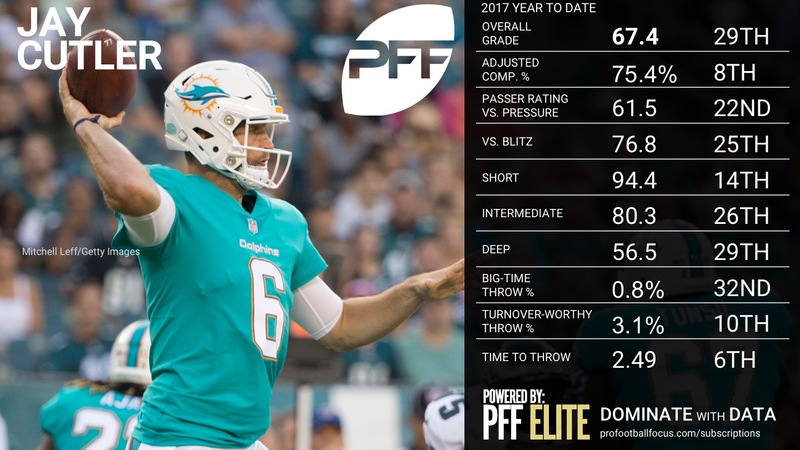 After a few big throws on the first couple drives of the game on vertical shots down the sideline and up the seam, Wentz and the Eagles offense lacked the type of rhythm we are used to seeing from them for a good stretch of the game, only to find it again as the game wore on in the second half. Wentz made two key tight-window throws in the red zone in the second half, one of them moving off the spot to find Torrey Smith on an in breaker for a touchdown, the other to Nelson Agholor on an absolute pinpoint throw just past the underneath coverage and in between both safeties for another score. 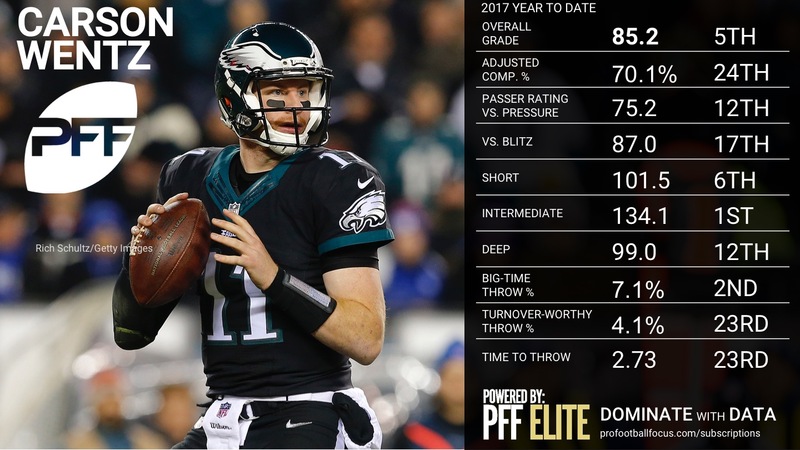 Wentz continues to accel with the majority of his game, but has been particularly crisp on intermediate digs, crossers and seam routes in between numbers at the 10-19 yard range, where he has completed 71 percent of his passes with five touchdowns, zero interceptions and a passer rating of 144.1 in that area on the season. 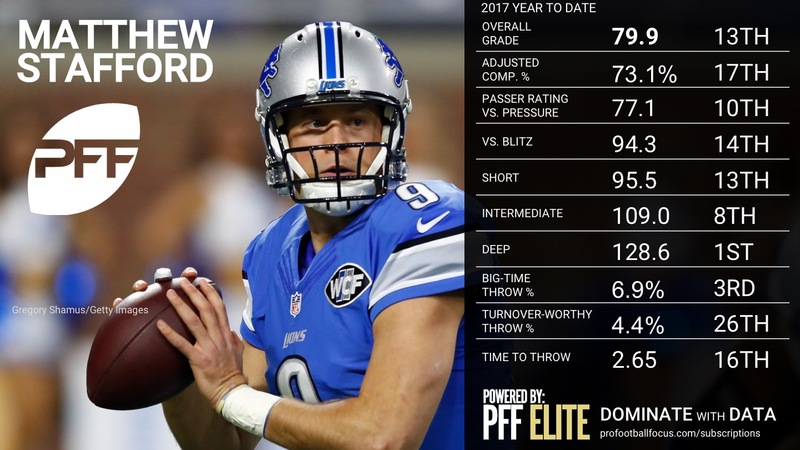 Smith continues to struggle as he’s now dropped to seventh overall in PFF grades after a hot start (behind Aaron Rodgers, see Editor’s note at bottom). 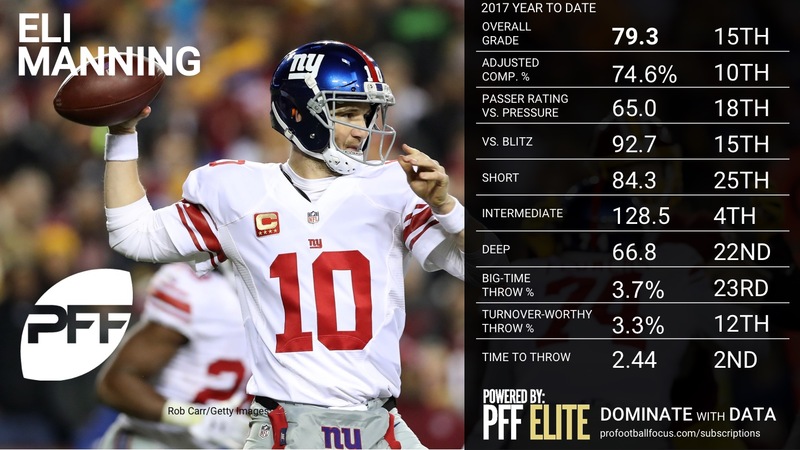 His early interception was the result of bad luck, but his fourth quarter overthrow resulted in hes second pick of the day and led to a late fourth-quarter lead for the Giants. Smith bounced back by leading Kansas City to a game-tying field goal, but Kansas City eventually lost in overtime and Smith finished with his second poor game in a row. 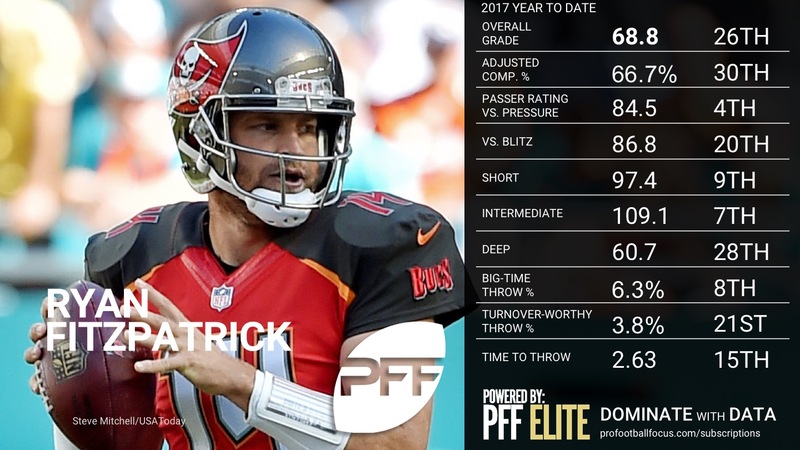 He completed only 3-of-9 passes thrown at least 10 yards in the air, including the late interception, as his early-season downfield magic has regressed in recent weeks. 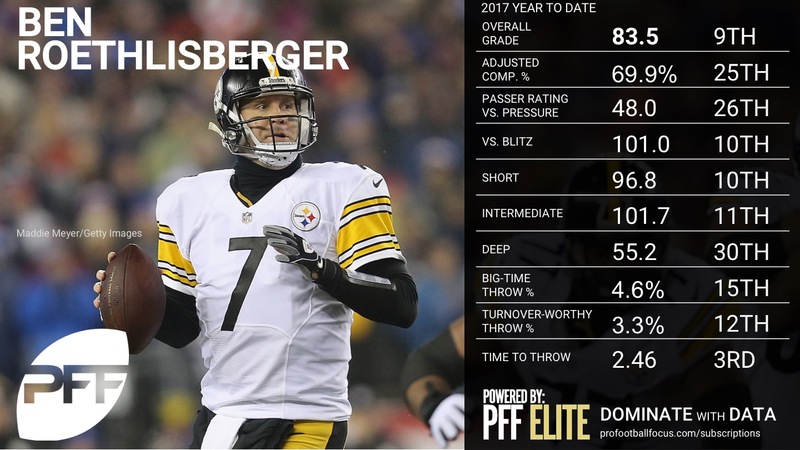 After a slow start to the season, Roethlisberger has the No. 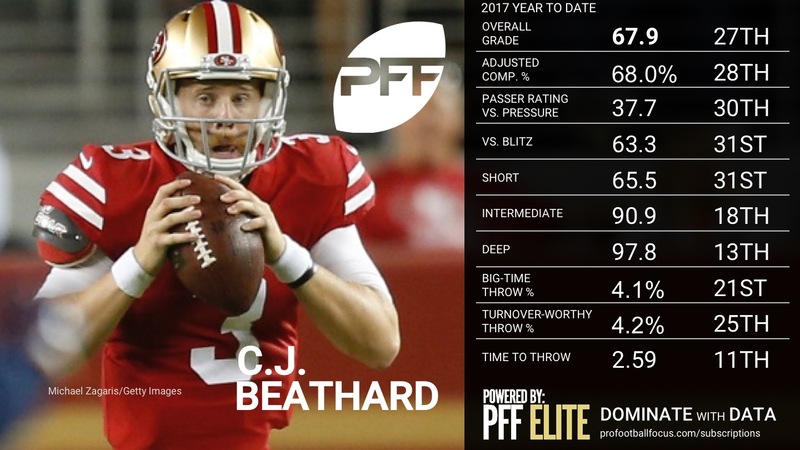 6 PFF grade since Week 6 of the season, and his Thursday night effort against the Tennessee Titans was his best effort of the year. 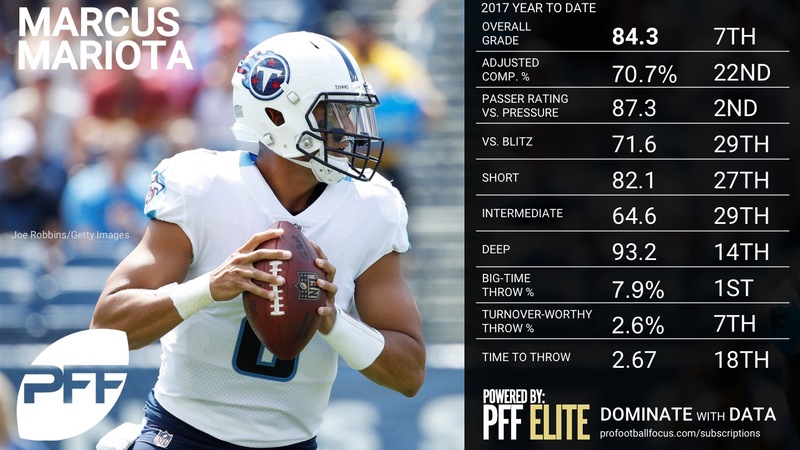 He showed well at the intermediate (10-19 yard) level where he hit 10-of-12 for 132 yards and a touchdown and the Pittsburgh offense did a fine job in the red zone where Roethlisberger threw three of his four touchdowns. 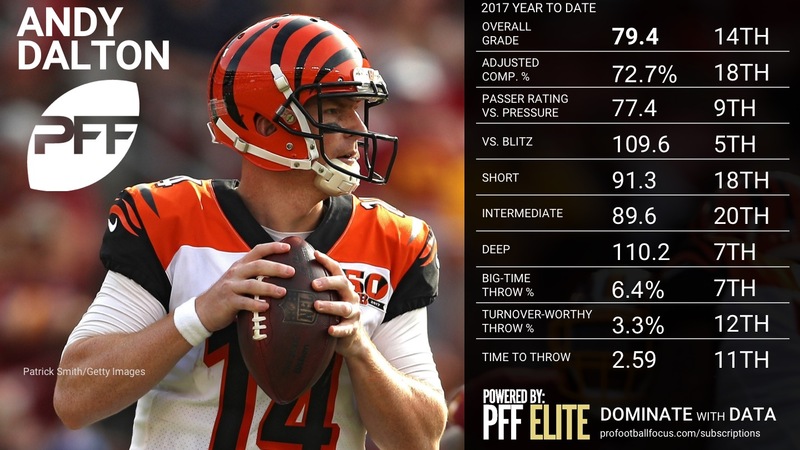 The deep ball continues to be an inconsistent part of the Pittsburgh offense as Roethlisberger went 2-for-8 for 64 yards and now ranks 33rd out of 36 qualiifers in adjusted completion percentage on deep (20-plus yard) passes, though his 41-yarder to WR Antonio Brown was a beauty and it was the biggest play of the night for the Steelers. 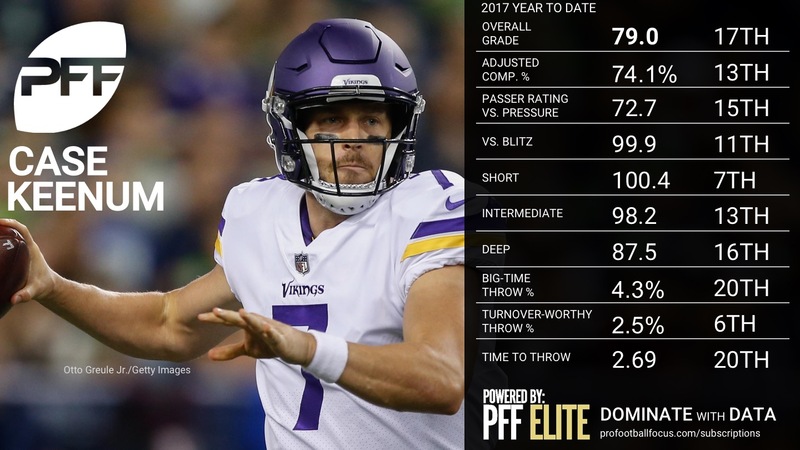 The wins haven’t been there the past couple weeks, but Cousins has been throwing the ball extremely well and continues to put stress on defenses with his vertical accuracy. 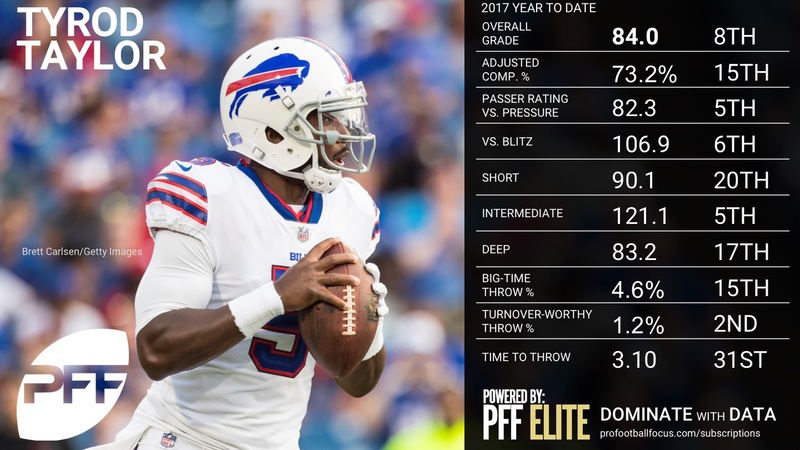 This week against a very good Saints defense, he was able to connect on 4-of-7 deep shots over 20 yards downfield, for a total of 134 and a touchdown. 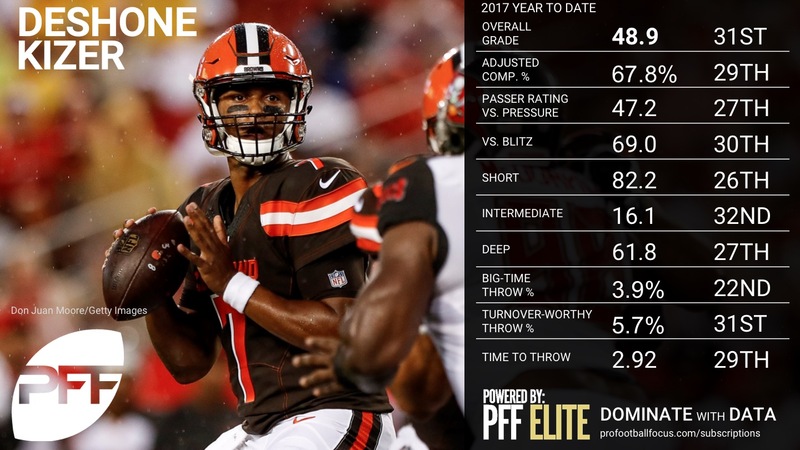 Perhaps the most impressive part of his game was how he maneuvered the pocket in the face of pressure, going 8-of-10 for 140 yards and two touchdowns on plays under pressure this week. 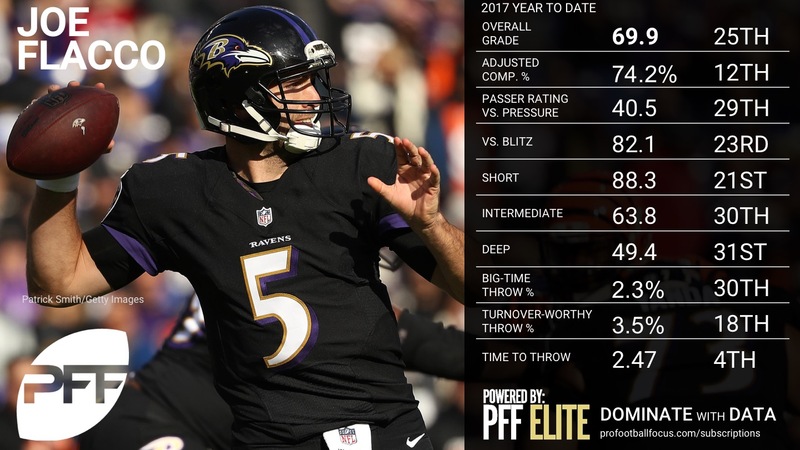 On the season, Cousins has been one of the more consistent deep ball throwers, hitting 48.8 percent of his throws traveling 20 or more yards (third-best), and a passer rating of 120.2 (also third-best). 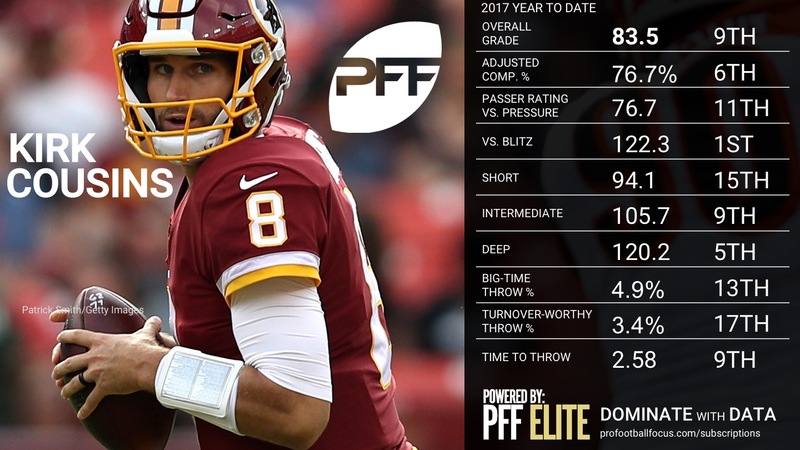 With Cousins recent play and the offensive playmakers seeming to gain confidence, the Redskins may be primed for a late season playoff push. Carr had a fairly uneventful game for the most part, lacking the explosive passing game down the field to keep pace with the Patriots. 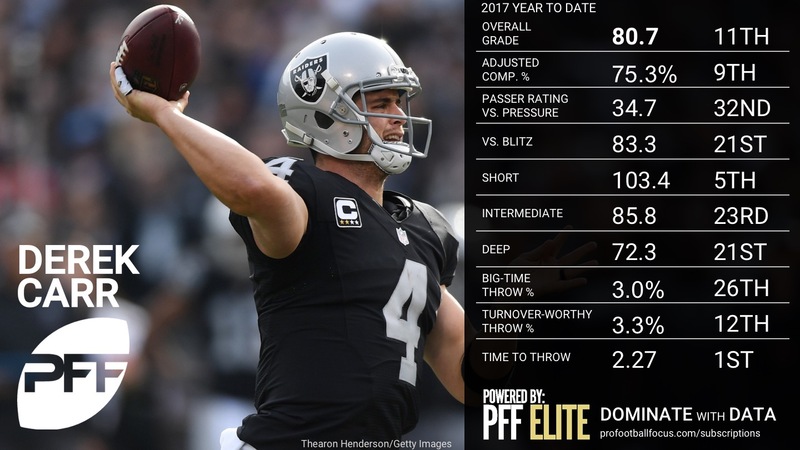 Carr’s placement on deep throws was just off on a number of occasions, going 2-of-10 for 48 yards, an interception and one dropped pass on throws traveling 20 plus yards in the air. 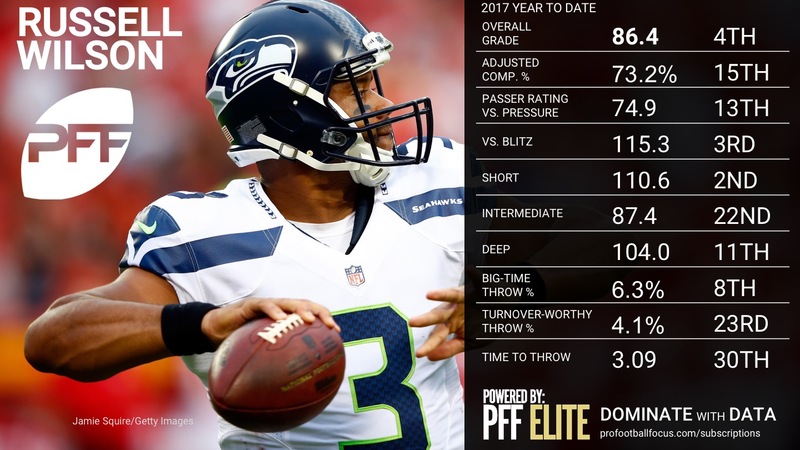 He was let down by his supporting cast a good bit, as he was on the bad end of five dropped passes (tied for the most in Week 11), as well as a Seth Roberts fumble inside the 5-yard line at the end of the half with a chance to get the game within a score. On the season, Carr has suffered the third-most drops by his wide receivers with 25 total. 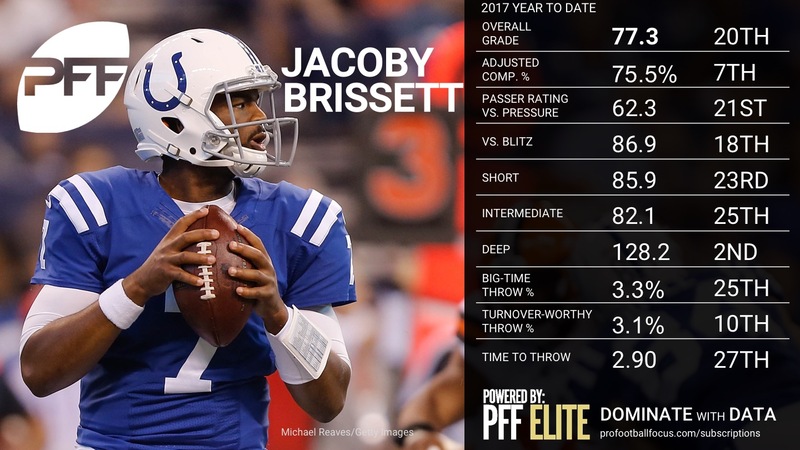 He is getting the ball out of his hands faster than anyone in the NFL with an average time to throw at 2.27 seconds, but lacks the big time throws down the field to help offset the quick passing attack, as he sits in T-22nd in the NFL in big time throws. 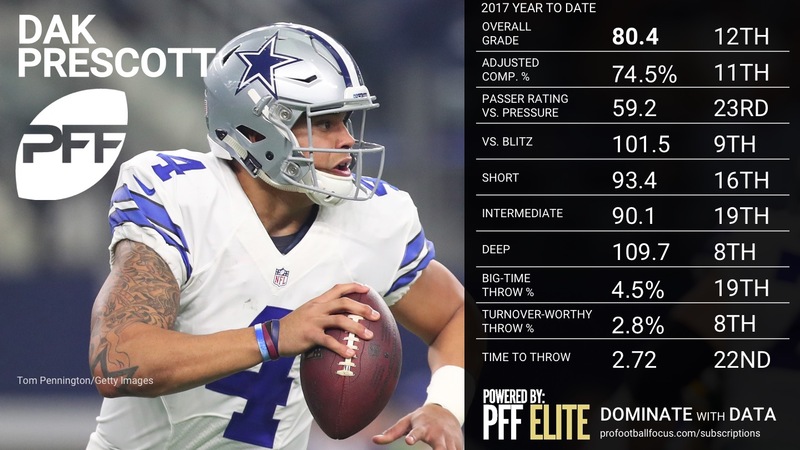 Prescott had another tough week in the pocket dealing with pressure. 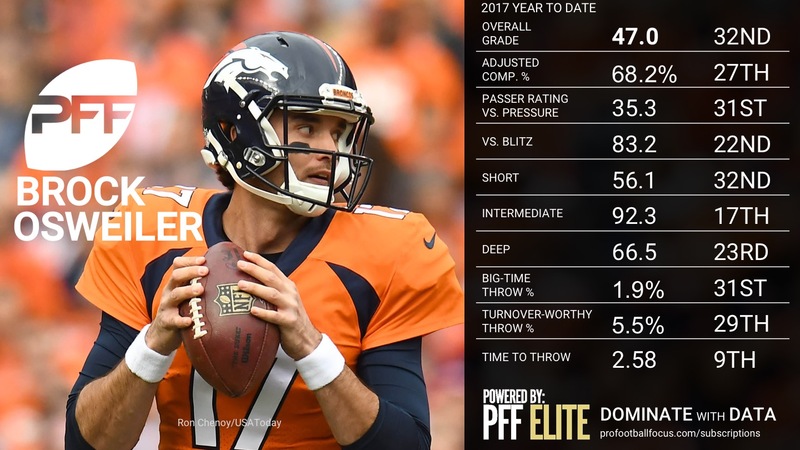 The past two weeks, without the few key pieces around him, he’s been under pressure on 45.5 percent of his passes (second-most) and has a passer rating of just 9.2 in that span. He was on the bad end of a dropped pass on a big time throw to Dez Bryant up the sideline, but also had a badly forced throw to Bryant up the seam on a 3rd-and-long attempt. The Eagles defense seemed to have a good beat on their passing concepts, with pressure up front and forcing tight-window throws in the secondary. 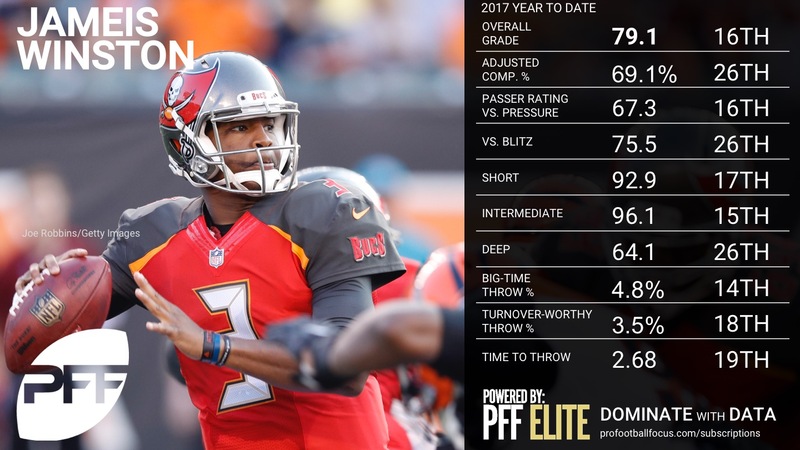 His play under pressure has been an issue in the absence of Tyron Smith – since Week 6 he has the second-lowest passer rating on such throws at 28.1 and completing just 36 percent of his passes. His game has lacked the type of precision we are used to seeing from him recently, looking noticeably uncomfortable and playing undisciplined in the pocket when he does have time, perhaps lacking confidence in the guys around him that ultimate make his play suffer as well. Last week’s performance saw Hundley muddle around for three quarters, but end up making some key throws in the fourth quarter to help propel the Packers to a much-needed victory. 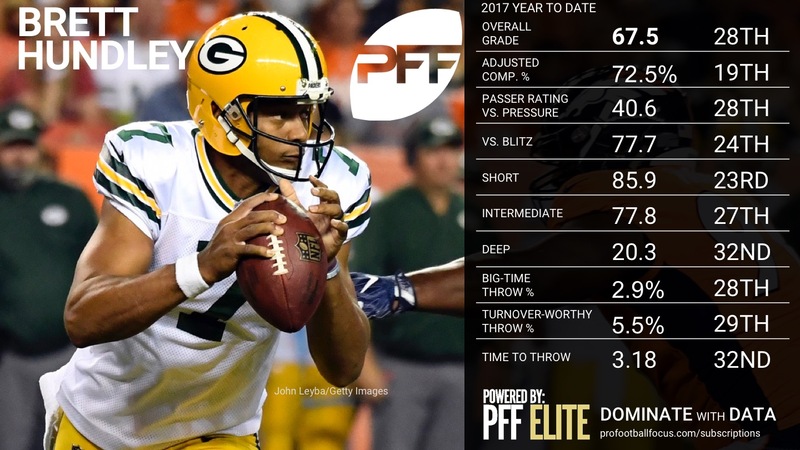 This week, Hundley came out with a disastrous performance in every area with one of the worst QB performances we’ve seen this season. 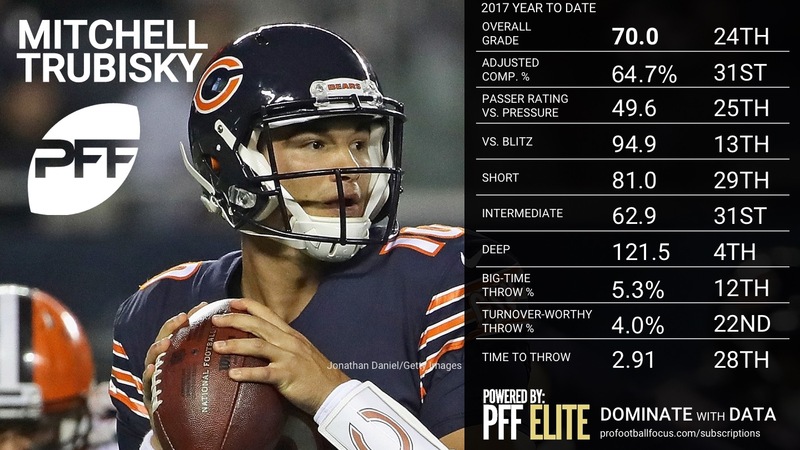 Hundley was off with his accuracy, made poor decisions forcing a few throws down the field, and lacked feel in the pocket as he alone was charged with three sacks and three hurries. 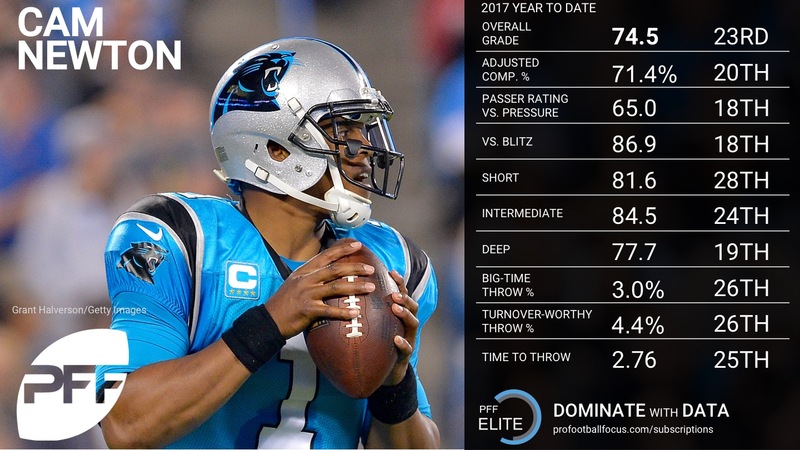 We’ve seen it in previous weeks but Hundley lacked any type of feel for both pre- and post-snap reads, as they came more to fruition this week with him holding the ball for an average time to throw of 3.66.